The way in which humans articulate identities, social hierarchies, and their inversions through relations with animals has been a fruitful topic in anthropological and historical investigations for the last several years. The contributors to this volume call attention to the symbolic meanings of animals, from the casting of first-year students as goats in medieval universities to the representation of vermin as greedy thieves in early modern England. 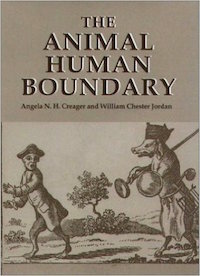 But the essays in this volume are also concerned with the more material and bodily aspects of animal-human relations, like eating regulations, aggression, and transplanting of animal organs into human beings (xenotransplantation). Modern biologists have increasingly problematized the human-animal boundary. Researchers have challenged the supposedly unique ability of humans to use language. Chimpanzees and gorillas, it has been argued, have learned to communicate using American Sign Language. In addition, some scientists regard the sophistication of modes of communication in species like dolphins and songbirds as undermining the view of humans as uniquely capable of complex expressions. Studies of nonhuman primates threaten to compromise the long-held assumption that only humans possess self-awareness. The question becomes: How can one firmly differentiate human beings from other animals? Contributors include Piers Beirne, Richard W. Burkhardt, Jr., Mary E. Fissell, Paul H. Freedman, Ruth Mazo Karras, Susan E. Lederer, Rob Meens, John H. Murrin, James A. Serpell, and H. Peter Steeves. Angela N. H. Creager and William Chester Jordan are Associates of the Shelby Cullom Davis Center for Historical Studies, Princeton University.